The double coat is heavy with a top coat that is hard to the touch, straight or slightly wavy. The undercoat is profuse and dense. Coat color is pure white, with no color markings. The breed has a black pigmented nose, lip and lid edges. The foot pads are dark. 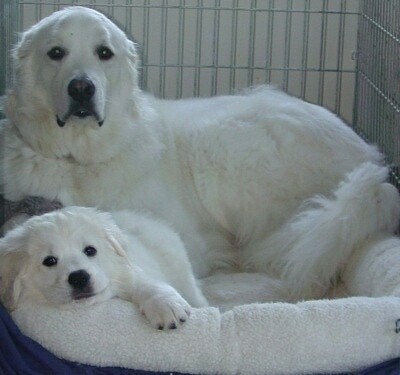 This breed needs an owner who is intelligent, preferably with prior big dog experience. The owner must be a strong alpha leader, fair, loving and very consistent with all rules. 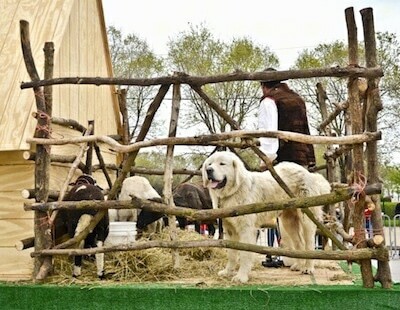 The Polish Tatra Sheepdog is used for herding, and as a guardian for flocks of sheep and goats. It can also be kept as a companion and a watchdog. This natural working dog is independent, self-thinking, highly intelligent and able to assess situations without human guidance. Socialize them well while they are still young and throughout their entire life. Basic obedience is a must. Devoted and loving to their family and close friends but will often be reserved around strangers. This flock guard tends to be territorial of the home and their surroundings so consistent human leadership is a must. They will give big warning barks at anything deemed suspicious or strange and will bite eventually if challenged or pushed. If left outside they will be awake and vigilant during night hours, patrolling the property. They will bark at anything out of place or unusual. They love snow and cold weather, very weather resistant. They are not dog aggressive and tend to get along with other non-canine pets. Generally very gentle with well-behaved and mannerly children. Genetic and health problems: hip dysplasia occasionally. Very few reported cases (less than 1%) of patellar luxation, juvenile cataracts, epilepsy, allergic dermatitis and bloat (gastric torsion). They need to be taken on a daily walk. While out on the walk the dog must be made to heel beside or behind the person holding the lead, as instinct tells a dog the leader leads the way, and that leader needs to be the human. Sheds its undercoat profusely in late spring and must be brushed and groomed. The rest of the year it stays remarkably clean due to the self-cleansing coat. Seldom requires a bath. Dry-mouthed, this breed does not drool. This breed originated in the Tatra Mountain peaks of the Carpathian Mountains in the south of Poland. Martin the Polish Tatra Sheepdog (Owczarek Podhalanski) at 3 years old—"Martin is of working dog lines and was born on the dairy sheep farm in Lemont Illinois called Golden Whole. 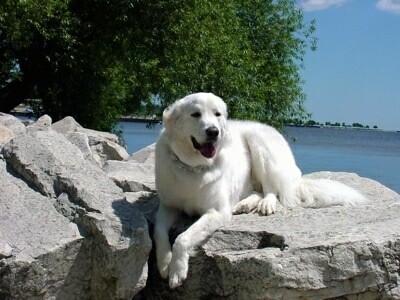 He is working with 4 other Polish Tatras in heavy coyote territory in the southwest area of metro Chicagoland."